Your furry friend has an array of emotions you need to learn to read. Kitties show a lot of emotion through their tails. 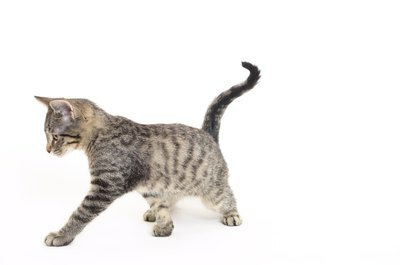 Your kitten will let you know when he's angry or happy, just by the movements of his back and rear extremity. Arching his back and shaking his tail can be a good or bad thing, depending on what else he's doing. You see it everyday: Felix backs his rear up to the wall, arches his back, sticks his tail straight up and shakes his rear. It looks like he's peeing, but you don't see or smell anything. Felines have scent glands at the base of their tails. When he's shaking his tail, he's releasing a small amount of his "perfume." Human noses aren't quite sensitive enough to smell it, although when another cat strolls by, he'll know that baby Felix was there first. This area is already spoken for. If your kitten is angry, you'll know it. In addition to arching his back and sticking his tail straight up, he'll fluff up his fur, making him look twice as big. This is a survival instinct in case a predator comes nearby. He'll appear larger to his enemy, ideally warding off a possible attack. You may also see little Felix doing this when he's startled. When a door slams in the other room, he'll become a little scared or anxious, causing him to tense up, arch his back, fluff up and shake his tail. Your furry little pal might simply be playing. If he's seamlessly prancing around on his tiptoes, arching his back, holding his tail up high and whipping the tip of his tail quickly from side to side, he's delighted, possibly a little overstimulated and letting you know how happy you make him. He'll also probably rub his face against the corner of the walls or rub up against your pant legs. Reach down, scratch him under the chin and toss his favorite catnip toy across the room -- he's full of energy and ready to pounce. Some felines are particularly chatty, especially if they're the only kitty in the house. Listen to the noises he's making while he's arching his back and shaking his tail. If he's not neutered yet and running around marking everything, he'll howl during these sessions, signaling to female cats that he is ready to mate. Hissing or growling lets you know that he's mad or unsure of his surroundings, while purring and chirp-like sounds signal that he's happy and ready to play. Why Would a Cat Cry When Stroking Its Lower Back?